I love this blog – always something well thought out and well written. Happy Happy LC! From the jaws that bite and the claws that catch! 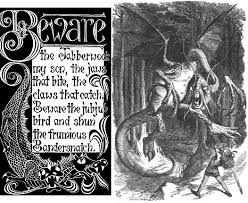 This entry was posted in Blogging, Books, Writing and tagged interesting literature, Jabberwacky, Lewis Carroll, literary blogs by pattytmitchell. Bookmark the permalink.